This year, as I evaluated the learning environment I had created for my students, I realized that as interactive and full of learning my class was, it was not very student-centered. Many of my activities were set up with me as the teacher in front of the class, and my students giving the answers, which I deemed as right or wrong. Not to say that there was no creative input from my students, but I had to be honest with myself--my classroom was just not very centered around my students. At that time of the year, I was also looking for ways to really delve into "ta" and "ti-ti" with my first graders. Most of my lessons involve a rhythmic and melodic concept, as well as musical skills, but I was interested in writing a lesson that was very rhythmically focused, so my students would be sure to be ready for their summative asssessment, in which they had to encode "ta" and "ti-ti" patterns on dry erase boards. Then I had an epiphany which could help with both of these issues: I could do learning centers with my students. 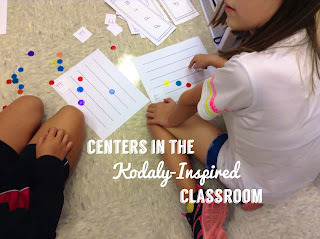 I had tried them my first year of teaching, and had liked them, but then I started my Kodaly training, and felt that Kodaly-inspired teaching did not lend itself to learning centers. Now, as a veteran teacher, I can see that if we put aside the notion that lessons always have to have five to six songs with seamless transitions, that (gasp!) 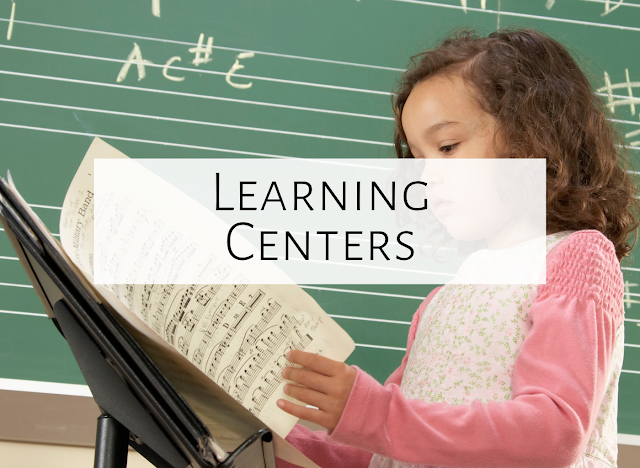 we sometimes deviate from this tried-and-true formula, that learning centers actually foster wonderful learning in the Kodaly-inspired classroom. The idea of learning centers is that every child is involved in learning the same concept, but at different stations, with each station approaching that concept in a different way. With my first graders, I split them up into four groups, and had each working on "ta" and "ti-ti" in a different way. Group #1 worked at the SMART board. They threw a soft ball at the SMART board, and when they hit one of the circles, a rhythmic pattern popped up, which they had to read. Group #2 chose a non-pitched percussion instrument from my box of instruments, and as a group, played the patterns showcased on rhythmic flashcards. Group #3 worked on a worksheet with different pictures. Students had to figure out whether each picture had one or two sounds, and write whether it was a "ta" or "ti-ti." For example, "baseball" would be a "ti-ti" and "bat" would be a "ta." Group #4 worked with colored circles. Some were colored red, some purple, some blue, etc. Students created their own pattern using these circles. Then, they clapped and said the colors, and then figured out what their pattern was with "ta's" and "ti-ti's." After five minutes at each center, students rotated to the next center, until they were able to do all the centers. It was wonderful to see how independent the students were with each task, and it was great to sit back and watch learning unfold without my help! I have since tried learning centers with other rhythmic concepts, with recorders, and with note letter names, and will soon do them for melodic concepts. Ideas for learning centers are only limited by your imagination! Just choose four ways in which you think students could independently work on a task. I've also found another plus to learning centers--the chance for assessment and intervention. With my fourth graders, I've been able to listen to them individually play recorder for their "recorder karate" belts, all while other students are engaged in other activities! This has been a wonderful opportunity to really hear how well students are producing sound, how well they remember their fingerings, etc. I've also been able to work one-on-one with struggling students, because again, all the other students are happily engaged in other activities. As I've done these learning centers, I've come to the realization that students really need to be very familiar with the concept to be successful at independent work. You might only do learning centers 4 or 5 times in a school year, after the students are ready for the challenge. Does it get noisy? Yes! But is wonderful learning taking place? Most definitely! My favorite moment happened when my fourth graders were working on recorder stations. One of the groups was teaching themselves a song on the board that used high D. One boy turned to another boy and said, "Remember? For high D you don't use your thumb." They were teaching each other....and I could sit back and enjoy it! Have you done centers in your music classroom? Feel free to comment below! Wow! This looks incredible; I MUST try it! 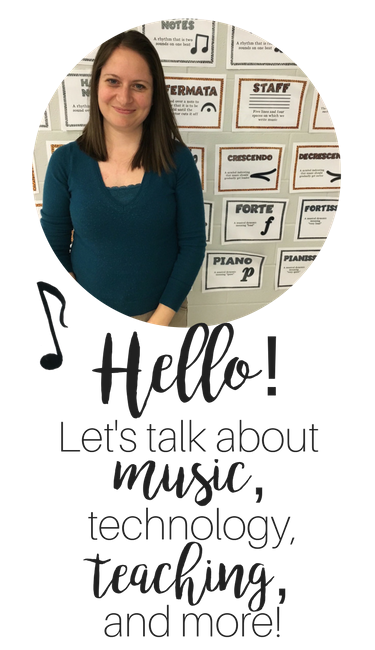 After 9 years of teaching mainstream classes in all year levels, I'm finally getting the chance to become a specialist music teacher. I'm also attempting my level 1 Kodaly certificate in January. I've been wondering how I'd cope with being "the teacher out in front of the class" as I love student directed learning, and rotational activities, such as I've used for literacy, maths, humanities etc., and I'm longing for school to come back in February (I'm in Australia) to give it a shot. When oh when is the holiday coming?